After our wonderful week in Wales, we had a few days at home. On one hot and sunny day we joined an RSBP children’s activity outing which was great fun (we took our own children along with us – it would have been a bit weird otherwise). Towards the end of the day we were sifting through the mud of the bay, seeking out coastal wildlife. Every overturned rock revealed a multitude of tiny crabs and each trowel-full of mud contained a number of miniscule shrimp-like crustaceans. Another member of the group found the shell of a sea potato, a kind of sea urchin. 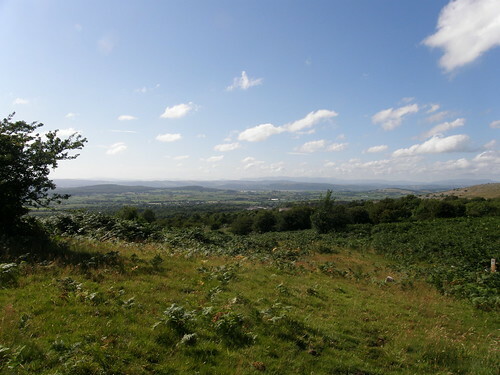 The following day – if anything, hotter and sunnier than the last – we were joined by some friends for one of our favourite walks: around the shore to Arnside for ice-cream, then back along Black Dyke and through Eaves Wood. I don’t seem to have taken a single photo on either day. Near the end of the week, with the sun shining once again, the kids and TBH, with some good friends of ours, were back on the bay. The children swam in one of the channels. I chose to be anti-social and went for an afternoon stroll on Burton Fell instead. Where is Burton Fell? 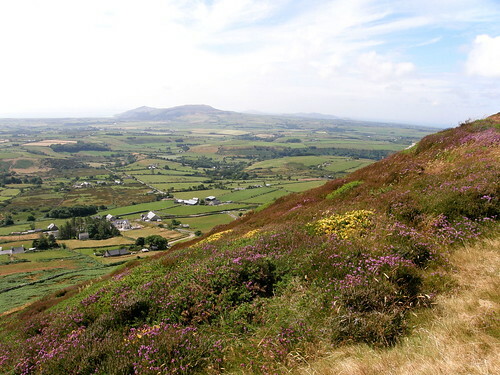 Well, I’m a bit vague on it’s exact boundaries: it’s one region of the sprawling limestone hill, other parts of which are called Dalton Crags, Lancelot Clark Storth and Hutton Roof Crags. It’s close to home – we can see it from our kitchen windows. With limited time (well that’s my excuse), I cheated a little by parking in a relatively high spot on the Clawthorpe Fell Road. As I set off, the views were superb, but, as is often the case, I was mostly busy scanning the immediate vicinity, looking for one thing in particular. I was on a mission, scouting for a distinguished member of our local flora. Around the tall bracken there were lots of busy white’s, and in the trees a couple of red admirals. 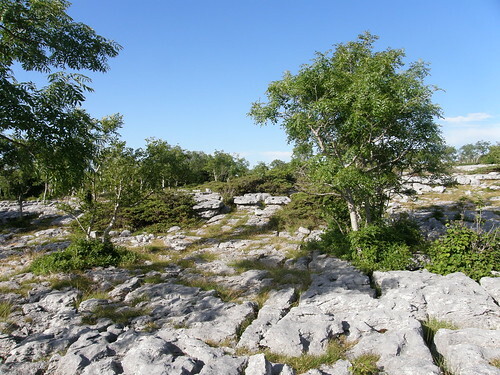 When I lost the rather sketchy path I was following, that tall bracken became a bit of a nuisance; I was relieved when it thinned and I found another tentative path heading uphill toward areas of limestone pavement. 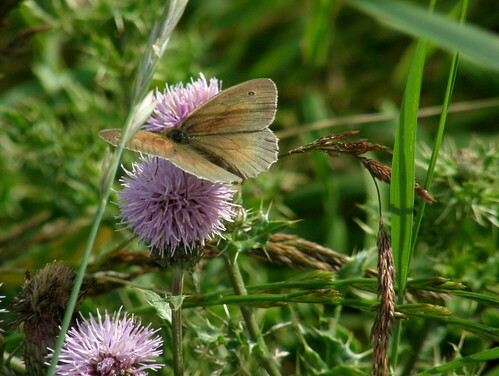 I still hadn’t found the flowers I was hoping to see, but there were more butterflies about. 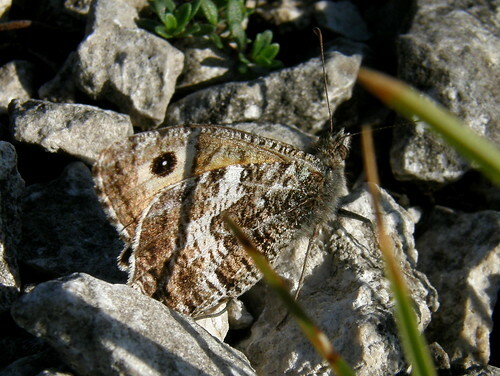 I chased around for a while in an effort to get a photo of this rather elusive grayling…. 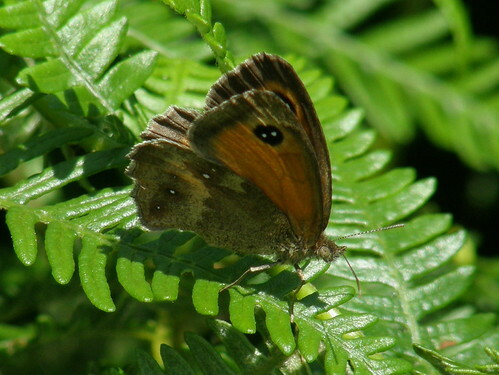 This butterfly, the largest of our ‘browns’, is a master of disguise – although fairly conspicuous when in flight, it can mysteriously disappear as soon as it lands, perfectly camouflaged against a background of bare earth and stones, always resting with its wings closed. 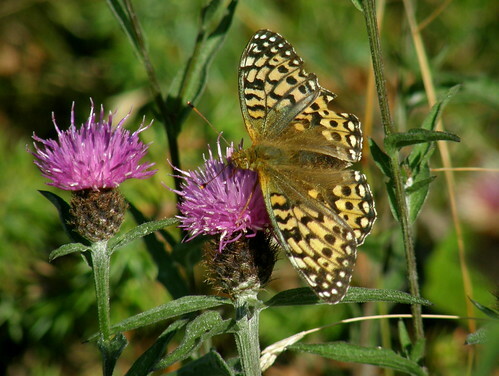 When it first lands, and when disturbed, the butterfly will raise its forewings for a second or so, revealing dark eye spots that stand out against a beautiful spectrum of browns. 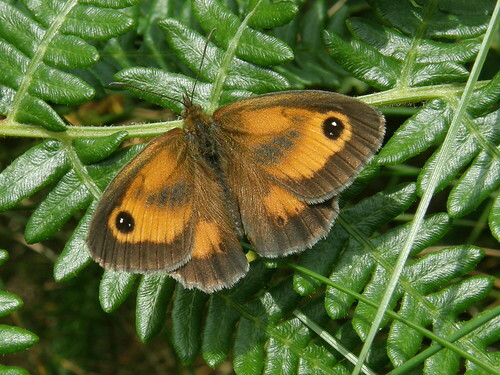 The excellent UK Butterflies website has a very handy guide ( on this page) to distinguishing between them. 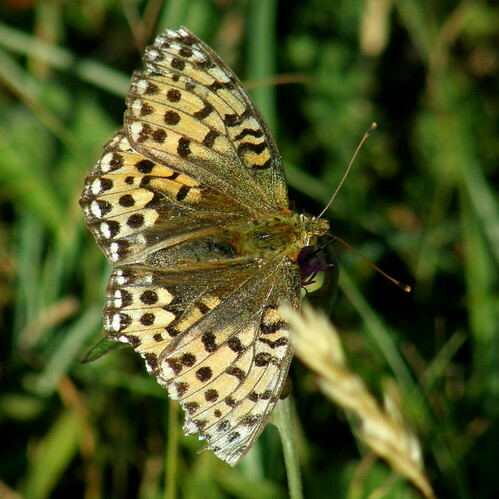 The underside of the wings has a greenish hue in the dark green variety, and your high brown butterfly has an extra row of ocelli. Easy. You don’t know what ocelli are? Well……err, follow the link to the handy guide then. It’s all beautifully explained there. With diagrams. 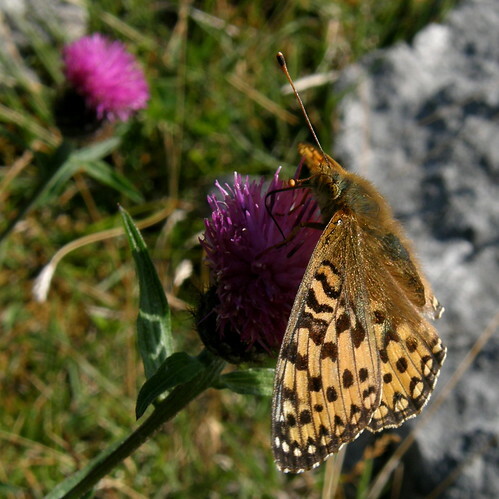 The fritillaries didn’t settle for long, but they didn’t seem to be at all phased by my presence, and they roamed around the isolated patch of knapweed. For a while I tried to follow them, but soon decided it would be better to find a reasonably comfortable spot to sit in and let them come to me. The whole area was maybe only one and a half yards square, so even on the far side of the patch, they weren’t too far away. But anyway, they weren’t that shy and I soon found myself using the camera’s macro setting. 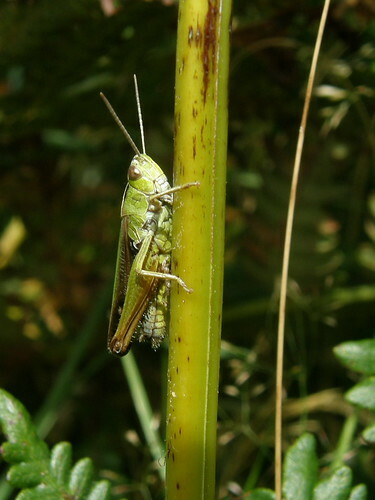 Both sexes are avid nectar feeders and typically feed in early morning or late afternoon, when they will constantly fly from flower head to flower head staying at each flower for only a few seconds. 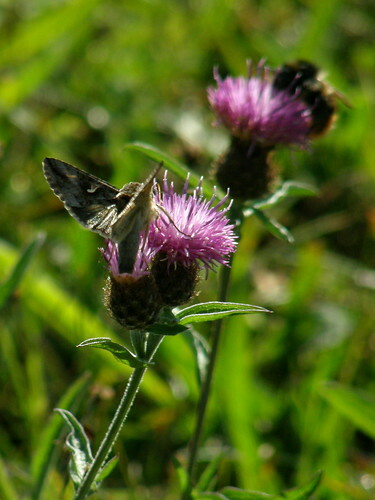 ..with their wings curving down around the flower heads. 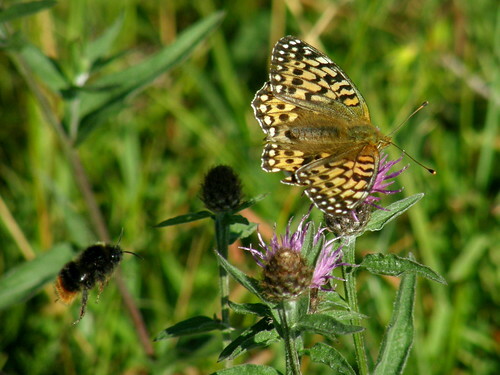 The fritillaries weren’t the only ones taking advantage of the knapweed. I’m not entirely sure what this is. 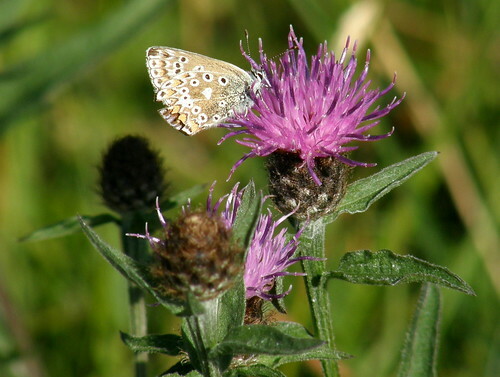 It might be a common blue. 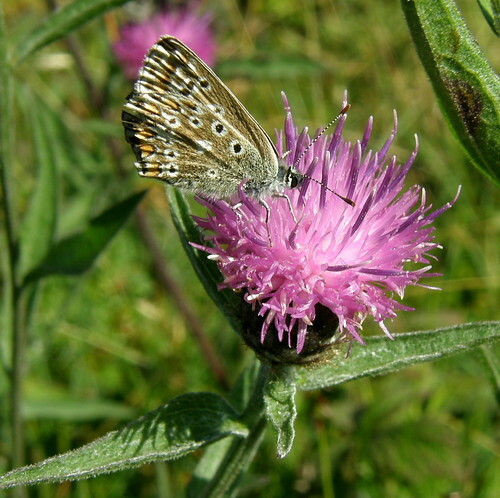 But it could also be a brown argus. 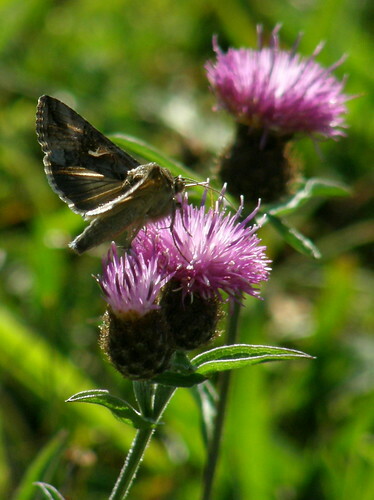 Or a northern brown argus. All three species are present in this area apparently, which is unusual, maybe even unique (I’m not sure), and the underside of their wings are very similar. There are distinguishing features, but I can’t pick them out on this photo. 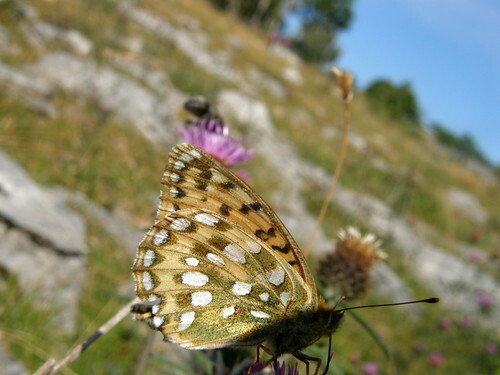 Frustratingly, the butterfly didn’t hang around for long, kept its distance from me and I never had a good view of the upper surface of its wings. 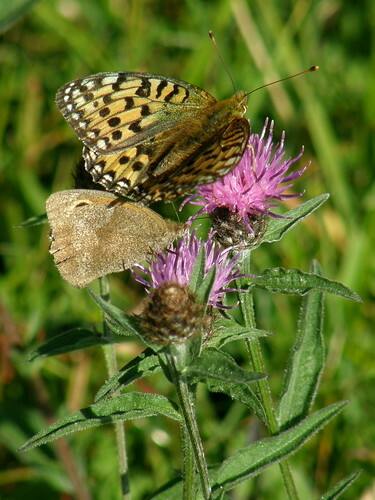 You can see from it’s size relative to the knapweed that it was tiny in comparison to the fritillaries. Later, a similar butterfly, or maybe the same one, tantalisingly returned, but although I got a slightly sharper photo, I still can’t decide which variety this is. 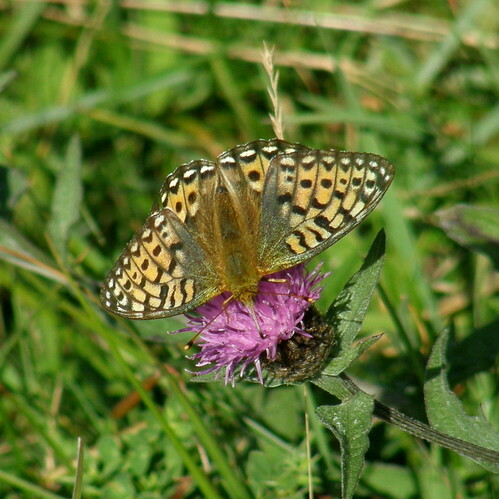 Another interloper, also much smaller than the fritillaries, stood out because of it’s remarkably sturdy looking body. 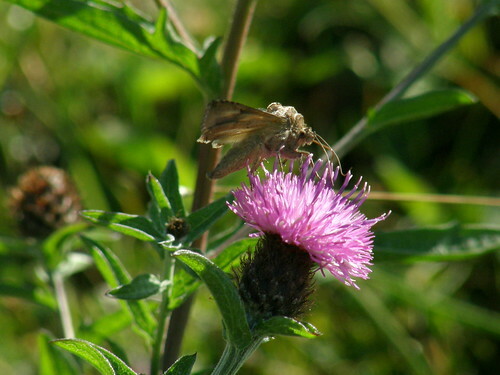 At first, assuming that it was a butterfly, I thought it might be some sort of skipper, but the superzoom camera is much more observant then I am: it’s a moth, a silvery y…..
…and perhaps even better here…. The whole little patch was very busy. 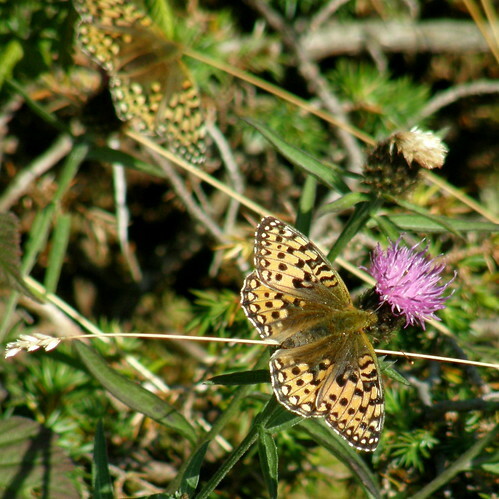 Sometimes the fritillaries briefly shared a flower, although I never managed to catch them together in a photo. They didn’t seem too comfortable together. The flowers were even more busy with bees than with butterflies. 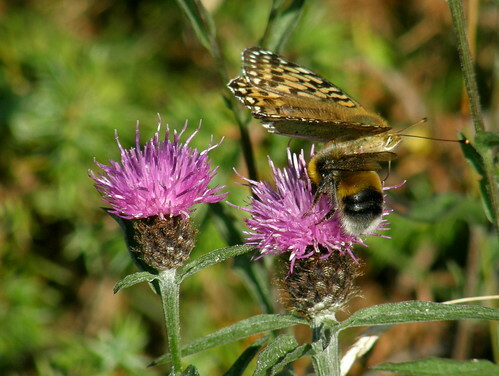 The bees were incredibly diverse in size and colour, but sadly, even more restless than the fritillaries and so hard to capture. I got a few photos though. 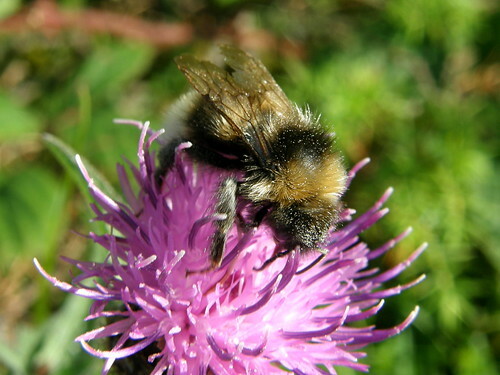 Tentatively identified as a male bombus lucorum, the small earth humble bee, or white-tailed bumble bee using the Natural History Museums bee identifier. 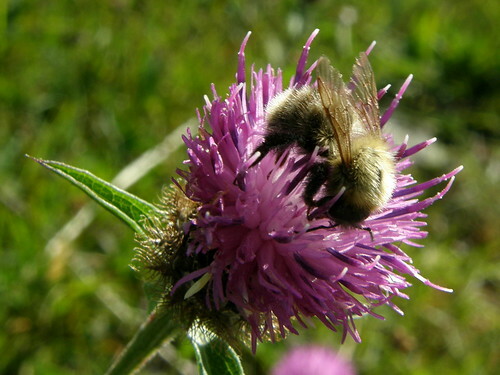 The one above might be bombus hortorum, the small garden humble bee, or garden bumble bee. But it might well not be. 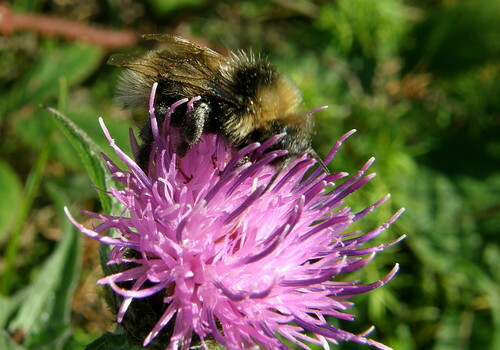 And an ID for this very pale bee is eluding me altogether…. I’ve often tried in vain to photograph birds in flight. 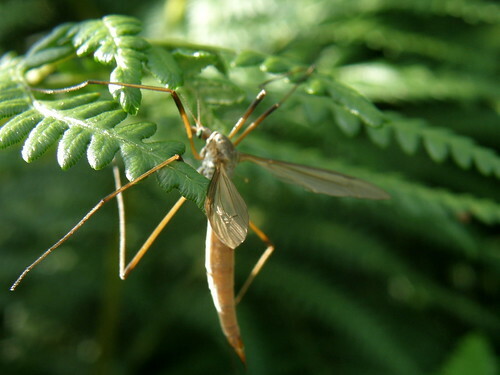 It’s never occurred to me to try the same thing with an insect: if I can’t get birds what hope with a bee, say? I didn’t even realise that the bee was in the photo until later when I downloaded it to our PC. 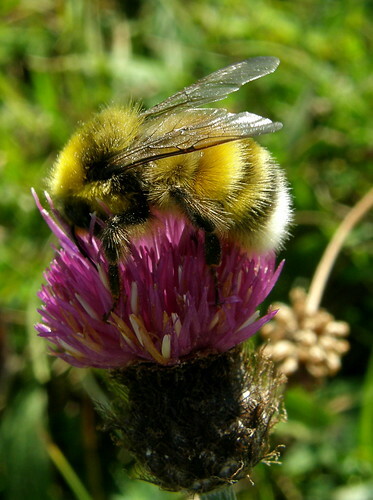 It could be bombus lapidarius, which luxuriates in three English names: the stone humble-bee, the large red-tailed humble-bee or the red-tailed bumblebee. 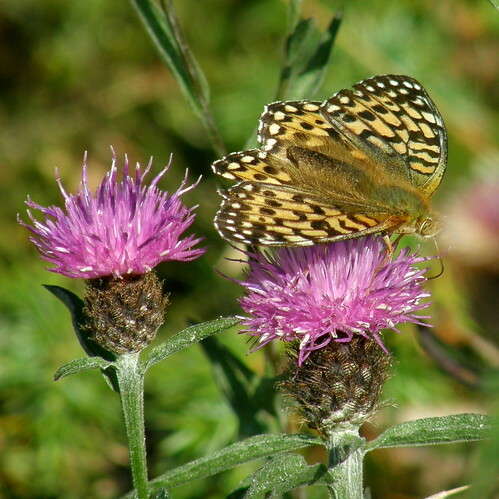 I’m really not sure how long I spent sitting in the sun admiring the butterflies and bees. I took an awful lot of photos, and thinking back, the memory is so vivid still, that it could have been hours, except I know that it wasn’t. Nearer half an hour, I suspect. I needed to get home, we were packing to go away again, and so I decided to have one last scout around in an attempt to find my original objective. I failed. 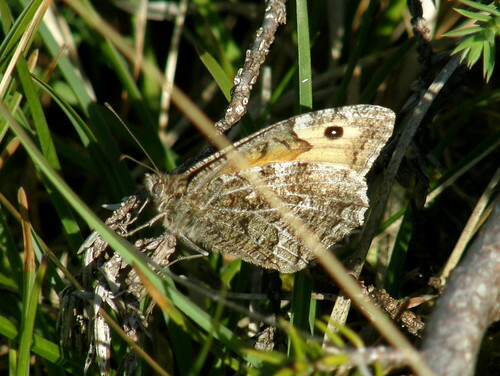 But I did see another grayling…. So, what was I was looking for? 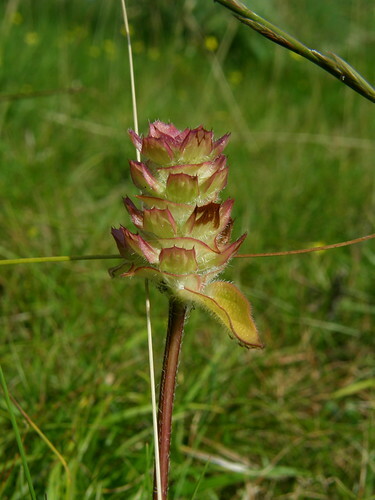 Well, somewhere amongst these clints and grykes..
…grow dark red helleborine, a kind of orchid. I’d only seen them in photos on t’internet. I’ve still only seem them in photos on t’internet. Another time. I had one more hope for the helleborine. There’s a spot closer to home where, over the last couple of summer’s, I’ve seen plants which had finished flowering, but which seemed to fit the bill. What’s more, in a location not too far from the road. So I stopped to take a look. This time they were still flowering. It was a tad gloomy under the trees by now, so I struggled with photos. 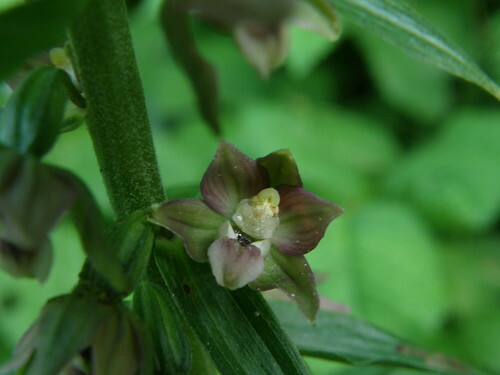 This, I’m pretty confident, is a helleborine, but the flowers are hardly dark red. 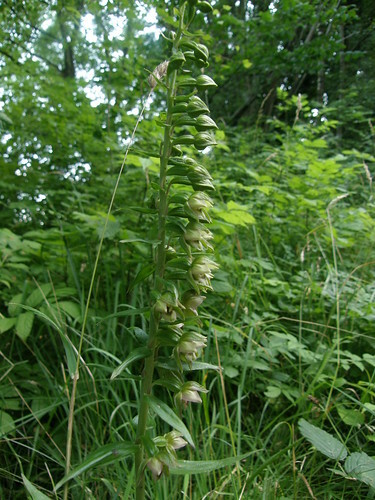 The wildflower key says that broad-leaved helleborine isn’t found in this area, but I know from the excellent I Love Arnside and Silverdale blog, that it does grow here, and what’s more, that it hybridises with it’s dark red cousin. 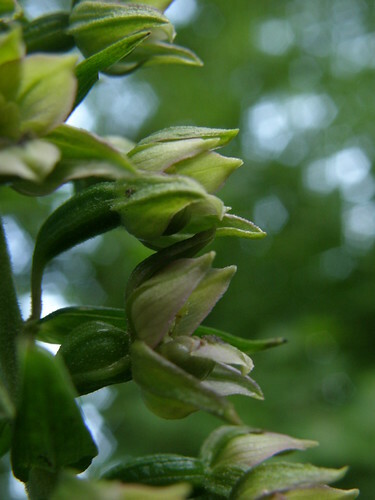 I think that this is broad leaved helleborine. It’s a funny old game this blogging malarkey. A single post to cover a whole week’s holiday, followed by another, longer post to cover a two hour stroll. It was a special two hour stroll however. And I managed not to get carried away quoting the old testament like Samuel L. Jackson in Pulp Fiction. I have seen the travail, which God hath given to the sons of men to be exercised in it. I know that there is no good in them, but for a man to rejoice, and to do good in his life. And also that every man should eat and drink, and enjoy the good of all his labor, it is the gift of God. So, finally the travail temporarily halted, giving a chap a chance to enjoy the good of all his labor. 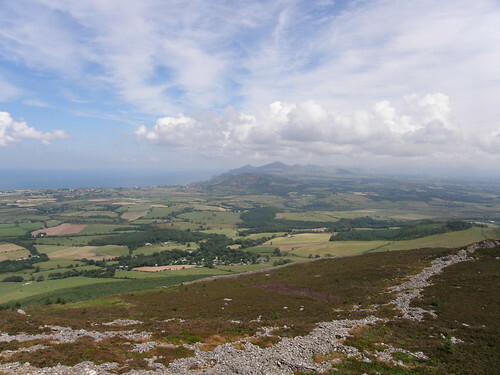 It feels like quite a long while ago now, but at the back end of July we made or annual trek down to the Llynn Peninsula for the summer gathering of the clans. A time to chill on the campsite and a time head for the beach; a time to snorkel and gawp at sea-life and a time to play beach cricket; a time to build elaborate castles and a time to row an inflatable dinghy around the bay; a time to burn sausages on the barbie and a time for a chinwag with a cup of tea. All of the usual fun and games in fact. 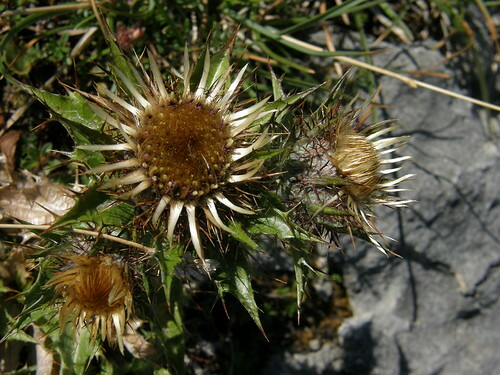 The weather was good once again – windy but generally bright. The inflatable dinghy was new: TBH bought it for little S’s birthday. It’s pretty huge – certainly big enough for the whole family to use together, at least at present. Watching TBH rowing it round in circles will be one of my abiding memories of the week. I did more snorkelling this year than I have before, I managed to get out at some point almost every day. The top of a low reef of rocks is revealed as low tide approaches and those rocks seem to be the most likely place to spot things. There are regularly many fish, some of them quite large. This year I saw a dogfish and followed it around the rocks for a while. I also watched a fairly sizable spider-crab methodically picking titbits off the rocks to eat. Rock-pooling too is very rewarding and B’s aptitude and enthusiasm for spotting and catching all kinds of interesting fauna continues to grow. I didn’t take my camera down to Porth Towyn at all this year, but since we go there every year, and have been doing so for many years, there are several previous posts with lots of photos. Part of what makes this holiday so relaxing is it’s predictability – every year we go back to the same laid-back campsite and essentially do mostly the same things we enjoyed the year before. 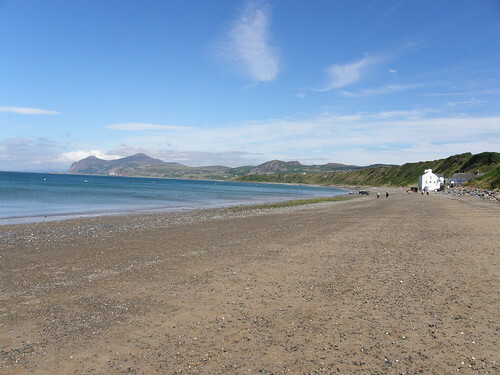 One slight departure this year: one afternoon, whilst the kids were being entertained at the circus (thanks Jane), TBH and I managed a short walk along the beach at Porth Dinllaen near Morfa Nefyn. 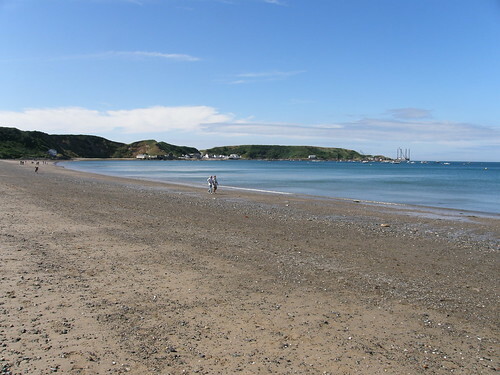 It’s a bigger sweep of beach than Porth Towyn, with a great view to Yr Eifl and it’s neighbours. 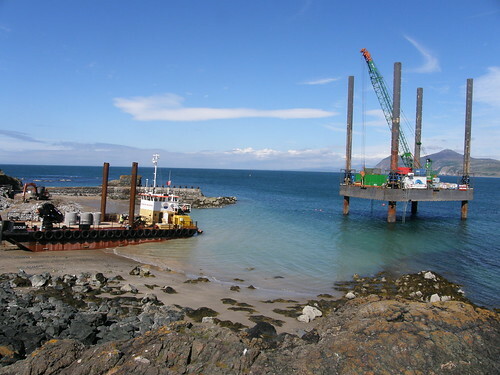 …near the end of which the lifeboat station is being rebuilt. It was a cracking walk, which I’d happily do again, especially since we didn’t get as close a look as we would have liked at Borth Wen on the far side of the headland. 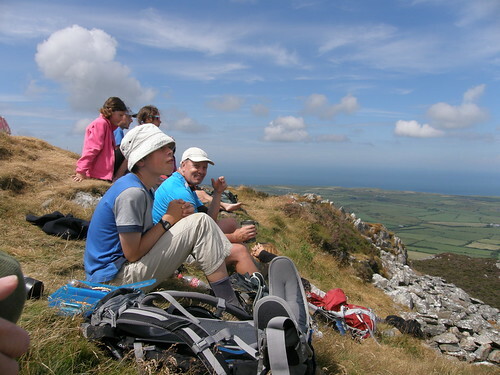 A regular fixture in our Tudweiliog trips is an ascent of Carn Fadryn. 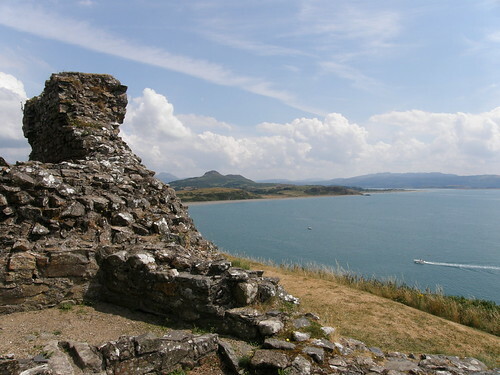 It’s a small hill, but it dominates this part of the peninsula and a modicum of effort is hugely repaid with vast views and a throng of wildlife. 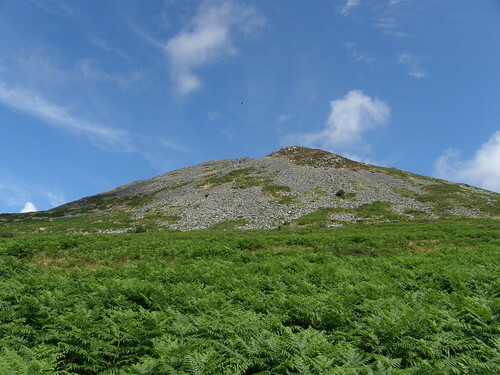 A flock of choughs were flying over the boulder field, and two pale bids of prey swept down low over the hillside. 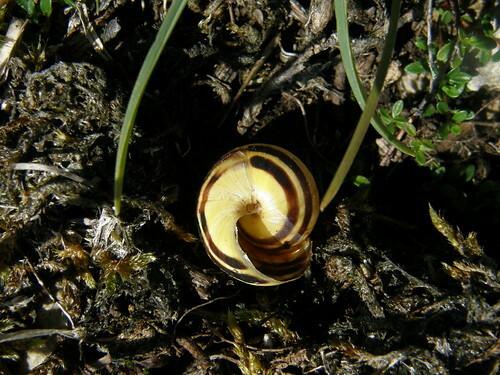 The bracken covered lower slopes seem to be a haven for creepy-crawlies. 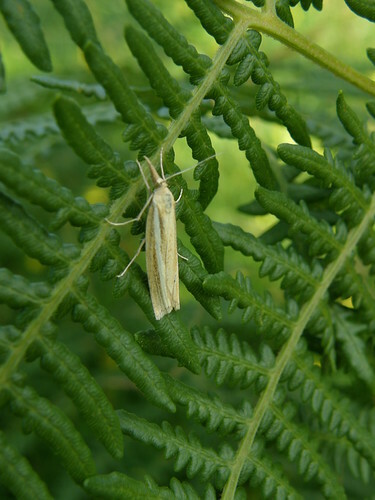 Labyrinth spiders cover the gorse with their intricate webs and hosts of butterflies, whites and…..
…flutter around the bracken. We always seem to see and least one dor beetle, and B enjoyed trying to catch the many grasshoppers…. 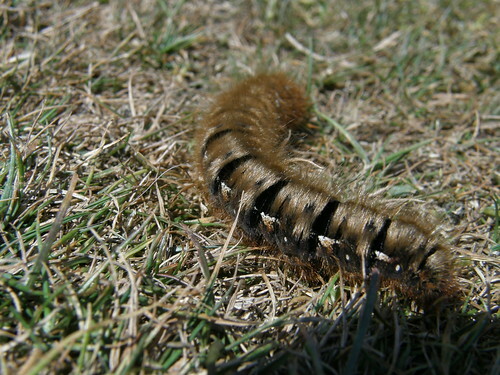 A little higher up, this hairy oak eggar moth caterpillar was inching across the path. 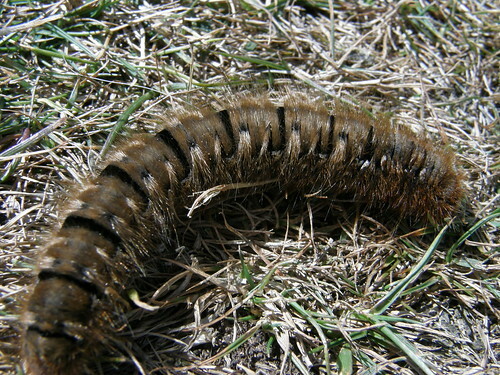 It’s quite a large caterpillar, I wondered about the moth. 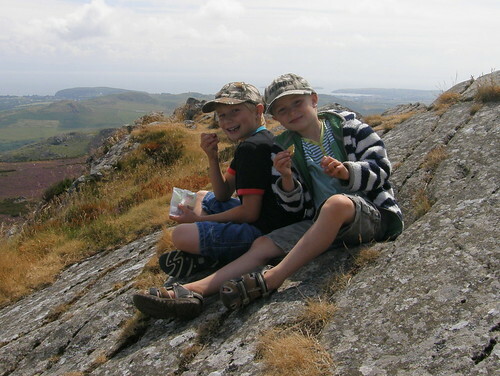 Lunch at the top, or some sort of snack at least, is de rigueur. 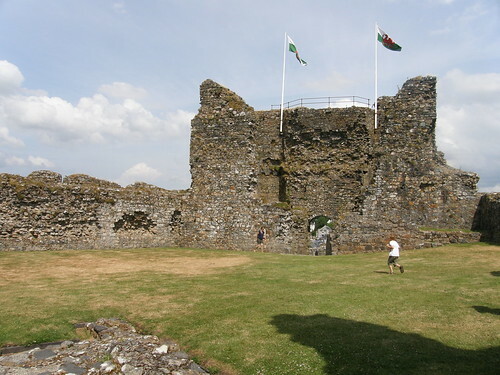 The kids seem to have decided that a visit to a castle is another essential element of this, or indeed any, holiday. 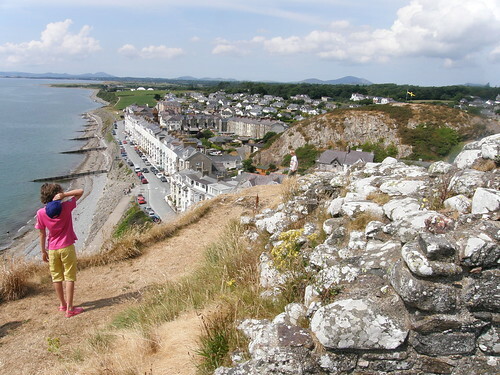 We’ve visited Caernarvon a few times, and last year branched out with a trip to Beau Maris. 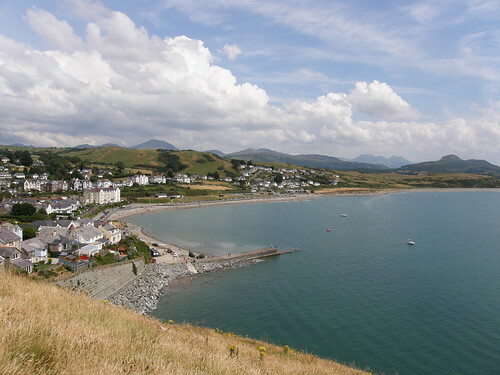 This time we took a short drive to Criccieth. 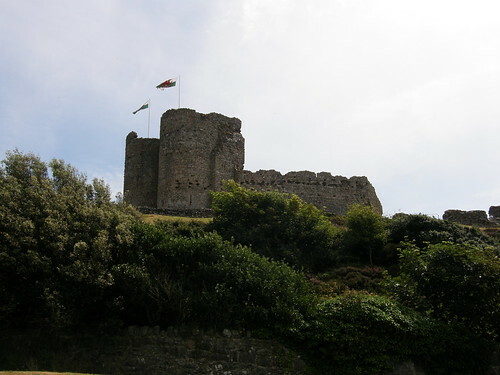 It has a small castle, a little deficient in dungeons and battlements and such like, and with only one one tower and winding staircase, but the cracking views over the town and along the coast in both directions go a long way to compensate. Today’s post has been brought to you by the wonderful northwest coast of Wales, by the Byrds and by Ecclesiastes.